It resembles the PA-10 with the fact that bicycle pump mounts on the down tube, however, the Neverex lugs on the PA-10 are painted black. The lugs on this bike are trimmed in black. The other tell tale feature that points this bike to the UO-8 model is the black bar tape and the covers on the brake levers in comparison to the picture at the top. It actually comes with a Brooks Saddle! Not the best of saddles but it's still a Brooks and a type that is no longer made anymore. It's a padded racing saddle. Probably not worth much because of a tear in the side. These Mafac Racer brakes are pretty unique, though, and look really cool. I think once I get everything cleaned up it will look really nice. The front derailleur is an interesting design. It works like a piston and probably has a spring pushing against it but when you pull down on the lever it pulls the derailleur over. Can't tell whether this is an upgraded derailluer or did it come stock. Two other bikes that I am working on from this same era have similar Suntour derailleurs but according to everything I read, the UA-8 came with a Simplex derailleur that was made of plastic and prone to breaking. Cranks are pretty unique, rather than five bolts there are three. This will look ever better, I think when I go to a single crank and take off everything else. To get this bike running again, all it needed was air in the front tire and a new tube in the rear. I think I am going to try 700c wheelset with 38c cross tires and I am going to either replace the bars with a pair of mustache bars and use aero levers or keep the bars and put on some Campy shifter/brake combos that the LBS might give me a good deal on. Definitely going to keep it geared for now. It will be interesting to see what it's like to commute to work geared. Everything on that UO-8 is original except the toe clips, seat, and rear derailleur. As you noted, the original rear derailleur was not durable at all. The SunTour VGT was the choice replacement derailleur, as it was one of the best you could buy at the time, and would have been a bargain at double the price. Peugeots in that era would never have used Japanese parts. They used all French material. 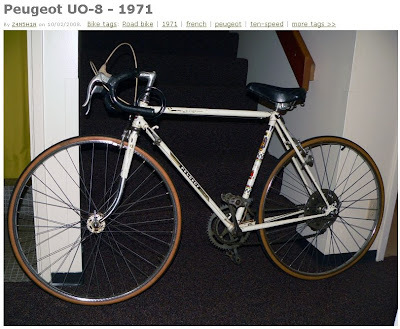 I was a professional bike mechanic from 1978 through 1984, and I sold and fixed countless UO-8's, so I'm very familiar with them and similar bikes.